These are indeed very happy times for Motherwell-based amateur football aces Colville Park AFC, writes Craig Goldthorp. For, five days after celebrating winning the Black Rooster M and M Trophy with a 2-0 final win over Eastfield at Falkirk Stadium last Wednesday, Colville qualified for the Scottish Amateur Cup final by thrashing Hurlford 6-1 at Hamilton on Monday night. Delighted Colville Park match secretary Andy Williamson told the Times and Speaker: “It was nice to win our first trophy of the season in the M and M final and hopefully it won’t be the last one. “It was a good victory for us because Eastfield are a very decent side. “We won the trophy in 2013 and 2017 and it is nice to win it again. “It was also great beating Hurlford in the Scottish semi-final. “We’re through to the final against Eastfield or Alba Thistle on May 26. Colville’s goals in the M and M final win were scored by Darren Miller and Chris Craig. And their six against Hurlford in the Scottish semi were netted by Scott Ferguson (2), Steven Higgins (2), Brian Hughes and Chris Craig. 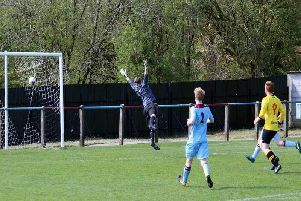 Hero Colville keeper Chris Truesdale saved a penalty at 2-1.